In 2009, China easily surpassed the US in total car sales to become the world’s largest automotive market. China’s vehicle sales total of 13.6 million units was more than 3 million units ahead of the second largest market, the United States. The dramatic rise of China’s automotive industry, in terms of both consumer demand and production supply, is truly unprecedented in the history of the industrialized world. No country has risen from a nearly standing start to the size and scale that China has achieved in just a few decades. Driven by the onset of the global financial crisis, the Automotive Industry Stimulus Plan published in early 2009 took specific measures designed to spark the growth of consumer demand. Measures included the reduction of sales tax for cars below 1.6L engine displacement, along with subsidies for new minibus or light truck sales for rural residents. These actions have accelerated the auto market expansion that was already in progress prior to 2009. The impact was particularly evident in China’s lower-tier cities, where the large number of first-time buyers helped to boost the performance of the manufacturers of these smaller vehicles. While aggressive tax cuts and subsidies have been behind much of the demand growth in 2009, the question now turns to whether this robust demand growth can be sustained in 2010. While very few expect a repeat of the 46% growth experienced this year, most auto executives believe that the fundamentals are in place to push sales up at least 10 percent, even without the incentives. The “Vehicles to the countryside” project will be extended to the end of 2010; Subsidy of motorcycles sales to the countryside will be extended to January 31, 2013. The number of cities for demonstration of energy-saving and new energy vehicles was expanded from 13 to 20. Five cities would be chosen to execute the personal subsidy to private buyers of energy-saving and new energy vehicles for demonstration purpose. Purchase Tax relief for 1.6-liter and below passenger vehicles will be extended until the end of 2010, however, the degree of relief was reduced, as the tax rate will rise from 5% in 2009 to 7.5% in 2010. Vehicle Trade-in and recycling subsidy standard would be enhanced from 3,000-6,000RMB to 5000-18000 RMB. While a breakdown of new subsidy by vehicle type is so far not clear, the subsidy for passenger car is reported to be 18,000RMB - three times than initial 6,000RMB. At first glance, many industry watchers expressed concern that cutting by half (from 5% in 2009 to 2.5% in 2010) the purchase tax benefit for 1.6-liter and below passenger vehicles would significantly impact sales in 2010. Another potential concern is that some personal-use vehicle buyers may have pulled ahead their purchase plan from 2010 to 2009 to realize the 5% tax savings. In addition, starting from January 2010 the China government began to issue a series of credit tightening measures, which may have an impact on the booming auto, housing and stock markets. China’s car market boom has certainly coincided with the increasing housing and stock valuations, due to the general wealth effect. In 2009, sales of 1.6L and below cars accounted for almost 70% of total passenger vehicle sales, which was more than 7% higher than that in 2008. Indeed, maintaining such robust growth will be challenging once the new tax rates are in place. However, there are still several fundamental growth drivers in 2010, which might help offset the negative impact of the reduction of purchase tax relief. Among those, urbanization is a primary driving force and expected to speed up in the coming years. Over the past six decades, the urbanization rate in China rose from 7.3% to 45.68% of the total population. Meanwhile, the urbanization trend is spreading from east coast to mid and west region, thus substantially expanding the coverage of “lower tier” (Tier 3 and below) cities. Compact and medium-sized vehicle demand will continue their growth momentum from 2009, driven by higher economic growth expectations in 2010 and income levels. Additionally, both private and business demand for mid and large-sized cars will also increase. The increase in trade-in vehicle subsidy will create a powerful incentive for current car owners in urban areas to trade in their old vehicles and buy a new car. An extension of the “van and pickup to countryside” program to the end of 2010 will continue to drive rural residents to trade in their old vehicles. The first 10 months of 2008 saw year-over-year growth of light truck and micro truck by 44% and 22% respectively, due to subsidy stimulus. The coming year is expected to have another double-digit growth for those segments. The increase of the number of cities targeted for new energy vehicle demonstration will help generate demand for hybrid and EV product offerings. Implementation of a personal subsidy in 5 cities will be helpful to shape positive consumer perception. It should be noted that even with a lower tax savings it is likely that demand in 2010 will downshift from an “exponential” to a “stable” path. In 2009, China seized an opportunity from the global financial crisis, and used a targeted stimulus plan to spark demand, especially for first-time buyers. The speed and effectiveness of the stimulus plan were indeed impressive. It was an uncomplicated value proposition which Chinese consumers quickly acted upon. The new plan continues to offer benefits to first-time customers entering the market, while simultaneously providing a strong incentive for people to trade in their older vehicles for newer vehicles with better fuel economy and lower emissions. Under such incentives, it is anticipated that demand structure will continue to move downward to smaller size vehicles including small cars, micro vans, and light trucks. Domestic brands such as Chery, Geely and Chang’ An will further benefit from such demand migration. While the initial 2010 plan is a bit more complex and some parts are yet to be fully defined, it is clear that China does not intend to relinquish its position as the largest car market in the world in the near future. Moreover, we shall not overlook that plans for vehicle export in 2009 were sharply impacted by the financial crisis. With the global economic recovery, we can expect China to pick up their export growth in broad overseas markets seeking lower priced cars. Bill Russo, is a Senior Advisor with Booz & Company as well as the Founder and President of Synergistics Limited. He lives in Beijing and has more than 20 years of experience in the automotive industry, most recently serving as Vice President of Chrysler's business in North East Asia. Jeffrey Zhao, is an Advisor with Synergistics Limited. He lives in Fairfax, Virginia and has more than 10 years of experience in the automotive industry, most recently serving as Senior Manager for New Business Development for Chrysler's business in North East Asia. 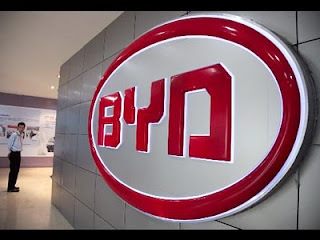 Jan. 12 (Bloomberg) -- BYD Co., the Chinese auto- and battery maker backed by Warren Buffett, will sell a rechargeable electric car in the U.S. in 2010 as it speeds deliveries to meet demand for fuel-efficient models. The first e6 hatchbacks will arrive in the U.S. late this year, Henry Li, general manager of BYD’s auto export division, said today at the Detroit auto show. BYD said the five-passenger car can travel 200 miles (322 kilometers) on one charge. 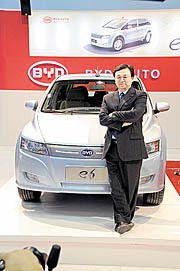 BYD’s plan accelerates the timetable set last year for a 2011 debut. That move is “very ambitious and probably too risky” in a market dominated by hybrids such as Toyota Motor Corp.’s Prius, said Bill Russo, a Beijing-based senior adviser at Booz & Co.
BYD, based in Shenzhen, China, was the country’s sixth- largest automaker last year based on sales. Li declined to give a price or a volume target for the e6 or specify which U.S. market would receive the car first. Batteries will push the e6’s weight past those of comparable compact cars to 5,060 pounds (2,295 kilograms), according to BYD. That’s 500 pounds more than Ford Motor Co.’s Explorer mid-size sport-utility vehicle. Buffett’s Omaha, Nebraska-based Berkshire Hathaway Inc. owns a 10 percent stake in the company. BYD introduced its F3DM plug-in hybrid to company and government agency buyers in December 2008, and sold 39 of the vehicles in the first 11 months of 2009. The automaker pushed back sales of the model to individual customers until this year after BYD failed to cut costs, Radio Television Hong Kong reported in November. BYD was unchanged at HK$68.10 in Hong Kong trading. The shares have surged more than fivefold in the past 12 months. In an interview yesterday in Detroit, Chairman Wang Chuanfu signaled BYD’s intention to hasten sales in the U.S., saying BYD would “start toward” the country in the second half. BYD sees a chance to reach U.S. buyers who want cars that use little or no gasoline and cut emissions of greenhouse gases, and it faces pressure in China to develop electric vehicles for energy security, Wang said at the North American International Auto Show. While overall passenger-car sales in China grew 53 percent last year, Wang said BYD’s deliveries jumped 160 percent to about 450,000. Wang, 43, was named China’s richest man by Forbes Magazine in November after Buffett’s investment helped increase his estimated personal wealth to $5.8 billion. Buffett, 79, has yet to visit BYD’s factories in China, Wang said. “I hope he’ll come,” he said. Jan. 12 (Bloomberg) -- BYD Co., the Chinese auto- and battery maker backed byWarren Buffett, may sell a rechargeable electric car in the U.S. as soon as this year to meet demand for fuel-efficient models, the company’s founder said. Beginning U.S. sales in 2010 would accelerate the timetable BYD set last year, when the Shenzhen, China-based automaker targeted a 2011 debut. Speeding up the model’s debut in a market dominated by hybrids such as Toyota Motor Corp.’s Prius is “very ambitious and probably too risky,” said Bill Russo, a Beijing-based senior adviser at Booz & Co. The company pushed back sales of the model to individual customers until this year after it failed to cut costs, Radio Television Hong Kong reported in November. BYD sees a chance to reach U.S. buyers who want cars that use little or no gasoline and cut emissions of greenhouse gases, and it faces pressure in China to develop electric vehicles for energy security, Wang said. Wang, 43, is to discuss details of BYD’s plans for the U.S. later today at a press conference at the North American International Auto Show. While overall passenger-car sales in China grew 53 percent last year, Wang said BYD’s deliveries jumped 160 percent to about 450,000. Wang was named China’s richest man by Forbes Magazine in November after Buffett’s investment helped increase his estimated personal wealth to $5.8 billion. Jan. 11 (Bloomberg) -- China supplanted the U.S. as the world’s largest auto market after its 2009 vehicle sales jumped 46 percent, ending more than a century of American dominance that started with the Model T Ford. The nation’s sales of passenger cars, buses and trucks rose to 13.6 million, the fastest pace in at least 10 years, according to the China Association of Automobile Manufacturers. In the U.S., sales slumped 21 percent to 10.4 million, the fewest since 1982, according to Autodata Corp.
China’s vehicle sales have surged since 1999 as economic growth averaging more than 9 percent a year has helped automakers including General Motors Co. and Volkswagen AG compensate for slumping demand in the U.S. and Europe. The market will likely remain the world’s largest, even as sales slow this year on a reduction in tax cuts, according to Booz & Co.
December sales of passenger cars, trucks and buses rose 92 percent to 1.4 million. For the whole of 2009, passenger-car sales rose 53 percent to 10.3 million. China’s government last year halved the sales tax on new vehicles to 5 percent and offered 5 billion yuan ($732 million) in cash to replace old ones, insulating the country from slumping global demand. The Chinese government announced plans on Dec. 10 to scale back the measures, including raising the tax on new vehicles with engines of 1.6 liters or smaller to 7.5 percent. 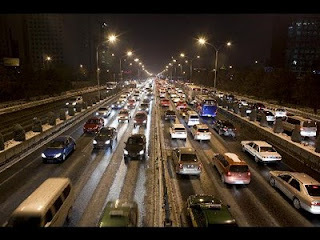 China’s vehicle ownership climbed to 51 million by the end of 2008 from 1 million in 1977. Per capital disposable income for Chinese households increased 46-fold in nominal terms during the period, also making the country the world’s biggest markets for products such as cell phones, beer and microwave ovens. GM and Volkswagen have targeted growing Chinese demand to compensate for slumping sales in the U.S. and Europe. GM, the biggest overseas automaker in China, said on Jan. 4 that its Chinese sales rose 67 percent last year to a record 1.83 million vehicles. Shanghai General Motors Co. sold 727,620 cars last year, an increase of 63 percent. GM sold 1 percent stake in Shanghai GM in December to partner SAIC Motor Corp., China’s largest domestic automaker. The $84.5 million deal will leave GM with a 49 percent stake in the venture. Sales at SAIC-GM-Wuling Automobile Co., China’s largest minivan maker, rose 64 percent to 1.1 million vehicles, accounting for about 60 percent of GM’s China sales. The minivans are sold for as little as $4,000 each. Ford Motor Co. is spending $490 million on a third plant in China, while Volkswagen plans to invest 4 billion euros ($5.7 billion) in the country by 2011. Seoul-based Hyundai intends to build a third Chinese factory as it aims to boost local capacity by 50 percent to 900,000 vehicles a year by 2011. China had 117 automakers at the end of 2008, according to the automobile association, raising the possibility of overcapacity. Automakers should “keep their heads cool” to prevent expanding production beyond demand, Chen Bin, who oversees regulation of China’s auto industry at the National Development and Reform Commission, said last year. Henry Ford introduced the Model T in 1908 as the world’s first automobile affordable for a mass market. The car was produced at the Piquette Plant in Detroit, helping the city become synonymous with the auto industry. GM, also based in the city, grew into the world’s largest automaker. The U.S. has since lost out to Asian carmakers producing cheaper and more fuel-efficient models. Toyota Motor Corp. ended GM’s 77-year reign as the biggest automaker in 2008. General Motors Corp. and Chrysler also both filed for bankruptcy as the worst recession since the Great Depression sapped auto sales. Jan. 11 (Bloomberg) -- China's 2009 vehicle sales rose 46 percent making it the world's largest auto market, a title held by the U.S. since the Model T Ford went into production a century ago. The nation's vehicle sales rose to 13.6 million units, according to the China Association of Automobile Manufacturers. In the U.S., sales slumped 21 percent to 10.4 million vehicles, the fewest since 1982, according to Autodata Corp.
China's vehicle sales have surged since 1999 as economic growth averaging more than 9 percent a year boosts consumer spending in the world's most populous nation. The market will likely remain larger than the U.S., even as sales slow this year on a reduction in tax cuts, according to Booz & Co.
China's government last year halved the sales tax on new vehicles to 5 percent and offered 5 billion yuan ($732 million) in cash to replace old ones, insulating the country from slumping global demand. The Chinese government announced plans on Dec. 10 to scale back the measures, including raising the tax on new vehicles with engines of 1.6 liters or smaller to 7.5 percent. China's vehicle ownership climbed to 51 million by the end of 2008 from 1 million in 1977. Per capital disposable income for Chinese households increased 46-fold in nominal terms during the period, also making the country the world's biggest markets for products such as cell phones, beer and microwave ovens. Automakers such as General Motors Co. and Volkswagen AG have targeted growing Chinese demand to compensate for slumping sales in the U.S. and Europe. GM, the biggest overseas automaker in China, said on Jan. 4 that its Chinese sales rose 67 percent last year to a record 1.83 million vehicles. Shanghai General Motors Co. sold 727,620 cars last year, an increase of 63 percent. GM said in December it will sell a 1 percent stake in Shanghai GM to partner SAIC Motor Corp., China's largest domestic automaker. The $84.5 million deal will leave GM with a 49 percent stake in the venture. Sales at SAIC-GM-Wuling Automobile Co., China's largest minivan maker, rose 64 percent to 1.1 million vehicles, accounting for about 60 percent of GM's China sales. The minivans are sold for as little as $4,000 each. China had 117 automakers at the end of 2008, according to the automobile association, raising the possibility of overcapacity. Automakers should “keep their heads cool” to prevent expanding production beyond demand, Chen Bin, who oversees regulation of China's auto industry at the National Development and Reform Commission, said last year. Henry Ford introduced the Model T in 1908 as the world's first automobile affordable for a mass market. The car was produced at the Piquette Plant in Detroit, helping the city become synonymous with the auto industry. GM, also based in the city, grew into the world's largest automaker. The U.S. has since lost out to Asian carmakers producing cheaper and more fuel-efficient models. Toyota Motor Corp. ended GM's 77-year reign as the biggest automaker in 2008. General Motors Corp. and Chrysler also both filed for bankruptcy as the worst recession since the Great Depression sapped auto sales. Booz & Company Publication of "China: Leading the Transition to New Energy Vehicles"